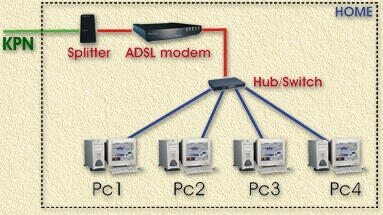 This article shows you a few variants that are possible to share the MXStream/ADSL connection with several computers. I used the KPN MXStream-Basic ADSL variant. Other ADSL connections might work in a similar fashion. I assume you already connected ADSL/MXStream, if not . and here is how to connect the ISDN version. Note: In case you're not useing a router (either in software or hardware), you will NOT be able to connect a maximum of 1 PC at a time to MXStream. For configuring WinRoute please read the ADSL/MXStream - WinRoute configuration page. For an example of a router configuration, see MXStream - Configuring the Vigor 2200e router. After hacking the Alcatel modem (Ethernet version only), the modem becomes a router! Here we connect all Ethernet cables (PC and ADSL) to a hub or switch. The hub or switch can be any model UTP based HUB preferably with a uplink/MDI crossed connector. You will need the uplink connector to connect the ADSL connector. If your hub does not come with such a connector, you should buy a UTP crossed network cable and use that instead. 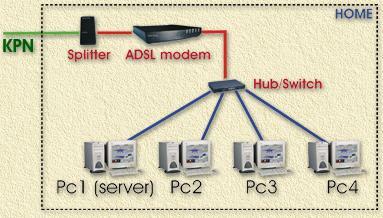 Your hub should have at least the amount op PC's plus 1 (ADSL) UTP ports. The ADSL cable goes to the splitter. 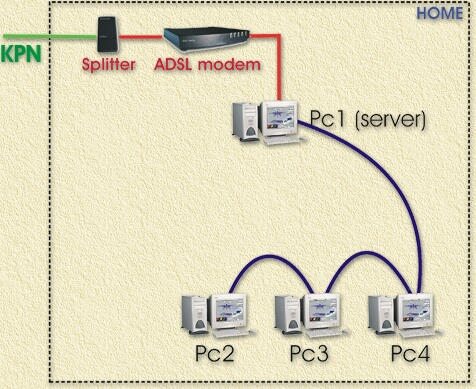 The ADSL modem is connected to the splitter. The Ethernet cable from the modem either is connected to the uplink UTP connector of your hub, or - using a UTP crossed cable - to a regular UTP connector. Each PC is connected to a regular UTP port of the hub/switch. Each PC (maximum of 4!) should be configured as a ADSL client as described by your provider (see the KPN MXStream manual for details). Each PC should have an unique IP-address! This setup is similar to variant 1 with one difference: we have a host server running which enables us to use a different IP-range for PC's. One of the PC's is to be configured as server either using software like WinRoute or Microsoft Internet Sharing (Windows 2000 and Windows ME have this standard included). 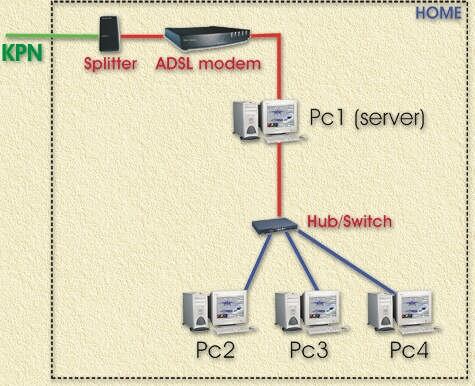 Similar to variant 1 and variant 2 with the exception that the ADSL cable is connected to a server directly and from that server an second network connection is connected to the hub or switch. There are no limitations to the switch or hub used, this can even be a coax network if you would like so (this requires NO hub). The Ethernet cable from the modem either is connected to the server. The second network-card of the server is connected to the hub. A BNC/Coax connection is setup as shown below, note that a terminator has to be connected to both ends of the "line". In the example above, a terminator is required on the T-Piece of PC1 and PC2. Note that BNC is an almost ancient network technique, cheap and slow (fast enough though for Internet!). The router/switch (like the LinkSys models) is both a "server" for DHCP, firewall, DNS etc. and a hub in one. Note: for MXStream there are not many ADSL routers compatible! This is due to the fact that MXStream uses VPN/PPTP over RAS (dial-up networking). See for example the Vigor 2200E MXStream configuration or the Dutch LinkSys page, or the SMC website. Both SMC and LinkSys have some amazing routers, some even have WiFi (Wireless Lan) and/or a printerserver buildin! The Ethernet cable from the modem either is connected to the router/switch (here indicated as hub/switch). All PC's are connected to the router/switch. All you need to do is to configure the router for Internet Sharing.